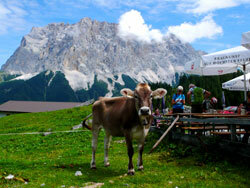 Learn German in Munich and experience a fascinating city! This beautiful city is located at the foot of the Alps, in the Bavarian region of southern Germany. The very heart of the city is the impressive Marienplatz which is home to the Neogothic Rathaus (city hall) and only four minutes’ walk from our Munich (Historic Centre) school. This is the perfect base to explore Munich from, as the Marienplatz is also the location of one of Munich’s largest U-Bahn stations. Munich is a city of architecture, culture, festivals, concerts, café culture and biergartens, always with plenty to do and see. Many people will recognise the famous Oktoberfest, the world’s largest beer festival which has been attracting visitors to Munich, hoping to sample beer and other culinary delicacies every October since 1810. Discover the more contemporary side of Munich with shopping in the luxury boutiques around Maximilianstrasse, a visit to the BMW Museum, or the Olympic Park which was built for the 1972 Olympics, but today is a popular venue for music concerts and festivals. If you are looking for a more peaceful side to Munich, local people will tell you that one of the prettiest places to visit is the Englischer Gardens, an urban park in the very city centre that is even larger than New York’s Central Park! Our Munich school is located right in the historic centre of city, just 4 minutes’ walk from the Marienplatz, Munich’s main city square. Here you will find a major metro stop and the beautiful neo-gothic town hall, a favourite with photographers! Our school is in a beautiful 17th century building, with 8 spacious classrooms, a student kitchen, free Internet access and a garden, where you can relax and practise German with other students. The school offers Intensive and Super Intensive German language courses of 20 and 25 lessons per week, with each German lesson lasting 45 minutes in duration. Classes are kept as small as possible, with a maximum of just 12 students in each group. If you would prefer to study in a smaller group, a Mini Group course with a maximum class size of just 6 students is also available. Alternatively, you can attend an Intensive + Private Lessons course of 20 group lessons, plus 5 or 10 private lessons per week. In each private German language lesson, you can concentrate on whatever German language skills you feel you need more practise at! If you would prefer to completely customise your German programme, take a course of Private Lessons only. Our Historic Centre school in Munich also offers Examination Preparation courses, so you can study for your TELC or Goethe examination with the help of fully qualified native German teachers. If you would like to perfect your German accent or pay particular attention to German pronunciation, you may wish to take our school’s Intensive + Pronunciation course, or if you would like to improve your German skills for work purposes, our Business Course would be the ideal option! 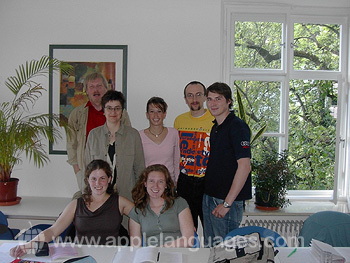 Our school recommends that if you want to learn as much German as possible during your time in Munich, you should stay with a German host family, as the family will speak to you in German and help you practise the language skills that you learn in class in real life situations. Host family accommodation is available with bed and breakfast for students who prefer more independence or half board (2 meals each day) for those who would like to practise German as much as possible! Alternatively, students over the age of 20 years can opt to stay in a shared apartment where you will live with other students. Each apartment is fully furnished, and you will have access to shared kitchen and bathroom facilities. For those looking for a greater level of independence, our Historic Centre school in Munich also offers private studio apartment accommodation. Our Munich school organises a cultural program, with a minimum of 3 activities each week, including guided tours of Munich, BMW factory visits, German films and parties at the school, beer garden trips, excursions to the Neuschwanstein Castle and the famous ‘Oktoberfest’. A new activity programme for the week will be displayed on the school's notice board every Monday. This program helps students to meet other people and use their newly acquired language skills outside the classroom! Fly to Munich International Airport and take the train directly from the airport to the centre of Munich. If you have booked accommodation in addition to your language course, we will provide you with directions to your accommodation before you travel. Munich also has excellent train connections both within Germany and to other European countries. Average score for our school in Munich (Historic Centre) based on 56 previous client reviews. Course was excellent, as was Munich. Outings too were very enjoyable - (Salzburg was wonderful) good mixture of people and good teaching. I made some very good friends and improved my German as well. Because I had only two weeks I didn't expect to gain a great deal of knowledge. However, I found that I had more than enough with which to work on my own during the next year. After that, I hope to return to Germany for more training. The course was very enjoyable. The teacher was helpful and only to willing to answer any questions. The standard of the lessons was good. My accommodation was standard student accommodation , with shared facilities. It was satisfactory, located in a fairly quiet area of Munich. The school had a relaxed atmosphere and I am considering returning next year. This Schools are an excellent way to improve a foriegn language. The course was wonderful! I never expected to learn as much of the language as I did. It truely was a great experience. My host family was extremely nice. The course was in depth and helpful. I am now taking a college level class and feel comfortable. Thank you for a great time. A well organized course. The staff were all excellent. A very useful experience to help learn a language. Fantastic, top class school! Worth the money, German lectures are so much easier!! Thank you!! I feel that i learned what i wanted to such as grammar. i also learned useful vocab for the future. i also liked the size of the group as i felt more involved with only 7 people and the teacher was able to get to know us better. Excellent. Perfectm high standard. Very friendly. Very helpful and very friendly teacher. Nice to have collegues from many other countries. I had one to one course and my two teachers were very knowledgeable and friendly. Munich is a very nice city and the location of the school right in the middle of the "altstadt" is great. I did enjoy my course, I thought the level of teaching was very high! 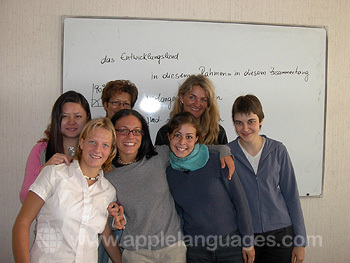 The teacher (Frau Claudia) showed the high standard of professional teaching for foreigners. Very satisfied! I only would like to say big thank you to my teacher, Frau Claudia!!! The quality of the teaching was excellent, i had a very experienced teacher who knew every nuance of his language. 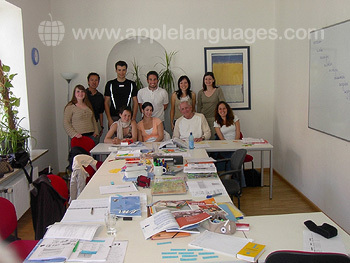 the course was very intensive and i felt it was so much better than the german course i follow in melbourne. The admin staff were also excellent, very helpful. its a v gd school, with a good central location. The accommodation was very reasonable for the price, also well situated. it was very clean and quite comfortable. I would highly recommend this school in munich. The course was great and the teacher was superb. My accommodation was brilliant! The teacher was good and the accommodation was great, the balcony was superb, as was the garden. The teachers were fantastic; very enthusiastic, fun and engaging. My accommodation was in a fantastic location, and was very comfortable. It was as expected, well organised and friendly, we learnt a great deal. The school was well placed in the centre of Munich. The teaching was excellent and it turned out quite well. My teacher was very friendly. I had a great time in Munich and I hope to come back next year. The school was very well organised, friendly and I learnt a lot while having fun. The apartment was very clean and comfortable, i enjoyed my time there very much. Course was a good introduction to see if German is something I want to pursue. School great, friendliness and patience of people really excellent. The school was perfect, it was in city centre so we could go anywhere we wanted after class. My family was perfect, they were friendly. The course itself was excellent, all staff at the school were very friendly and helpful. My accomodation was very good, the food was excellent and I even got assistance with the homework from the host family. I had collective and individual course. That was a good combination. The collective course was dynamic and very friendly. The individual course was focused on my needs, intensive and the way it was done was friendly too. My accommodation was in a beautiful apartment. Teachers were excellent and I like having two teachers with such different approaches. Textbook and other materials were very good. Other students were interesting and we could communicate together pretty well. The two free-time activities (Faust opera and a film) were excellent and not expensive. Location of school and of accomodations were easy to reach by U-Bahn. My course was awesome, I really learned a lot there. The teachers were incredible, really nice people; and if I could repeat these 4 months I wouldn't doubt of doing it in Munich. It is a lifetime experience, these were the best 4 months of my life!!! The school was great. The staff were vey helpful when I wanted to move class. I loved my teacher and I thought the classes were very enjoyable, funny and beneficial. Even though everyone was a different age or nationality we all got on really well. I will really miss the school. My accommodation was perfect. My host family were the perfect hosts. Our room was lovely and comfortable. Nice and big with everything you needed. She kept our room clean for us and did some washing too. The food was delishious too and we didn't want to leave. My three weeks in Munich was one of the best times of my life and I already really want to go back. The teachers were excellent. Enjoyed the comraderie of the other students. The text books are well written. I will highly recommend this course. Really great teacher made it very worthwhile experience, even though I was only there for a week. The school was very modern and spacious. The course was excellent and the teachers were great. I had wonderful accommodation. I found the course very helpful as regards structuring sentences in German and also with grammar. The teachers were of a high quality and were very helpful. The workbooks provided were also extremely helpful. The host treated us very well and was kind enough to take us out on excursions. Course was great, the teachers were good and the classes were interesting. I learned a lot and had great fun. We had a good week and learnt a lot, it has certainly given me an appetite to learn more German. My accommodation was in a very convenient part of town with lovely flat mates. We made a lot of friends, even though we were only there for a week. The course was awesome! I met so many people from around the world and learning German in Germany with other people who don't speak your language really helps the German conversation improve. My apartment was great. I had roommates from around the world which made living always interesting. I recommend this course to anyone. I wish I could have stayed 2 more weeks. Lederhosen and dirndl – Oktoberfest I am coming! Munich – Beer, sausages & castles…. My Munich-tastic time in Germany! Sausages and so much more in Munich!